Updated April 25: Congratulations to Anne, the winner of the $20 Dishcrawl discount! Check your email for more information about how to redeem your prize. Blogger’s note: Interested in a $20 discount for the next Dishcrawl Louisville event (a bourbon-themed, Derby-centric crawl through Fourth Street)? Leave a comment on this post that answers the following question: “What is your favorite part of Derby?” For two extra chances to win, like Dishcrawl Louisville on Facebook and follow Dishcrawl Louisville on Twitter, then come back and tell me you did all that. You have until 11:59 p.m. Wednesday, April 24. I’ll announce the winner on Thursday, April 25. 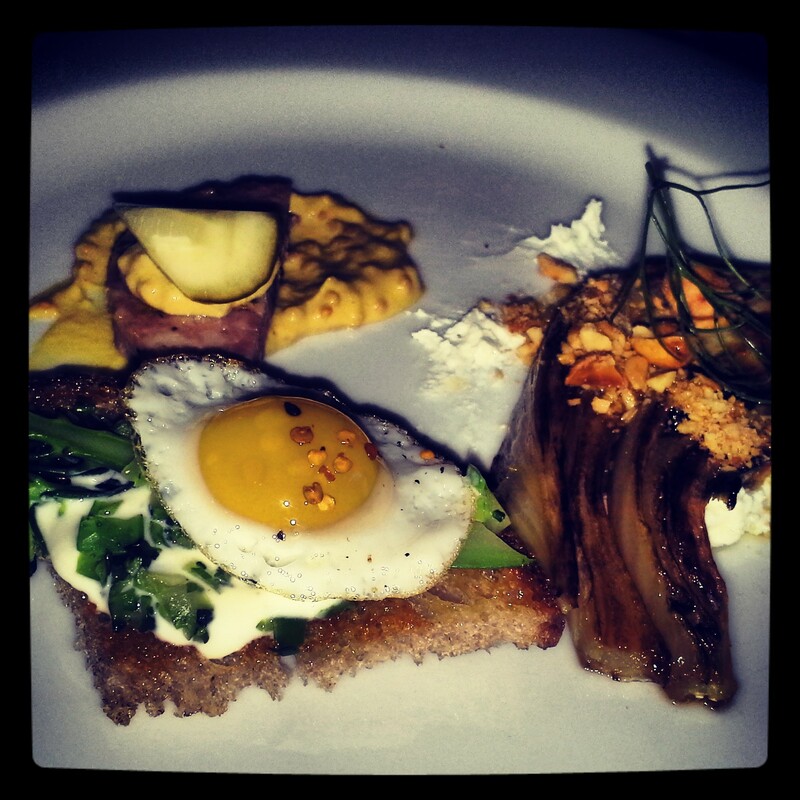 Quail egg toast, pork and pistachio galantine and grilled fennel from Rye. A new organization has arrived in Louisville to showcase some of the best food the city has to offer. Dishcrawl organizes events across the country that turns food lovers into tourists in their own town. For $45 per ticket, participants are guided to four restaurants within walking distance of one another to sample dishes from the businesses. The participating locations (with the exception of the starting point) are kept secret until the Dishcrawl is underway. It’s like a dinner party, social gathering and scavenger hunt all in one. Louisville is the latest addition to the participating Dishcrawl cities. Dishcrawl Louisville’s inaugural event, a NuLu/East Market Street-based evening, took place this week, and a bourbon-themed Derby crawl will take place along 4th Street on May 1. I got a chance to tag along for the Nulu crawl. Here is an outline of some pros and cons of the experience. You will eat food and visit restaurants you might not have experienced on your own. The four stops on the Nulu crawl were Against the Grain Brewery, Taco Punk, Rye and Ghyslain, places that several of the participants told me they had never visited. Though I’d visited these restaurants before, I got to eat food I had never tried, such as Against the Grain’s seitan “chicken” wings (it did taste like chicken!) and Rye’s pork and pistachio galantine (it’s like fancy bologna!). The food is tasty. Some of my favorites were the aforementioned seitan, the chorizo and potato taco from Taco Punk, and the dessert trio from Ghyslain, a bistro and chocolatier. That chocolate changed my whole world view. The food will fill your belly by the end of the night. Taco Punk provided the most generous portions of the evening. All of the crawlers received three tacos and a side of chips. That, on top of the other restaurant samples, made for a filling dinner. A Dishcrawl = fun date night. There were several couples at the event, and they seemed like they were having a blast. But the Dishcrawl was also fun for the groups of friends and solo attendees. Everyone mingled and got to know new people. Good times. You walk off some of those calories you eat. I had walked about a mile by the time I made it back to my car. My pedometer was pleased. The price is in “Treat Yo’ Self” territory. Tickets to join a Dishcrawl event are $45 per person. This is a lot of money for regular, working people. Some portions are tiny. With the exception of Taco Punk, the restaurants provided food that was more amuse-bouche (thanks, Top Chef) than appetizer-sized, which was disappointing to a big-dish American like me. The crawl goes on rain or shine. We managed to avoid the big torrents of rain during the Nulu crawl, but I packed an umbrella just in case. But I wasn’t looking forward to crawling in the rain, which would have made my experience soggy. The next Dishcrawl Louisville event is Wednesday, May 1 at 7 p.m. If you have a spare $45 and are looking for something new to do around Louisville, I say go for it. If you have a spare $25 and you’d like to win a discount on the next Dishcrawl Louisville event, leave a comment, like Dishcrawl Louisville on Facebook, and follow them on Twitter. I follow DishCrawl Louisville on Facebook. This is such a fun idea, and I’m a new reader, really enjoy your blog! The horses and all the festivities!! I also like Dishcrawl on FB! !